Robin Soderling wasn’t there to make it easy for Roger Federer to win his first French Open title and his 14th slam, but even he couldn’t prevent from Federer to achieve his goal. A Spanish Fan, the rain and Soderling combined weren’t enough to stop Fed from tying Sampras’ 14 grand slams and becoming the 6th player in the history of tennis to achieve a career grand slam and the first since Andre Agassi. Federer came out like a hungry lion set free from his cage, destroying Soderling 6-1 in the first and showing why his record was 9-0 against the Swede prior to this match. The second set wasn’t easy at all, and after the fan burst into the court and the rain picking up it seemed like the game evened out. Soderling started hitting his shots, Federer starting misfiring many of his and the set reached a tiebreak. 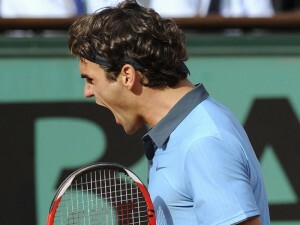 Like in the first set, Federer destroyed Soderling in the tie break, 7-1. From there, it seemed that only if a lightning would strike Roger that the cup won’t be in his hands. The rain kept coming down, but no lightning was there to stop the Swiss from winning it 6-4 in the third set and receiving the Roland Garros trophy from Agassi. 15th coming in Wimbledon? I have a feeling this win, despite Federer not having the best year in his career and this tournament not being his best slam performance, will give him an extra boost and a year or two more in his career. There’s still doubters, but for me and a lot of other people, he’s now officially the best tennis player in history.